At approximately 0240 hours Wharton fire fighters responded to 15 East Dewey Ave. on a reported well involved dwelling fire. 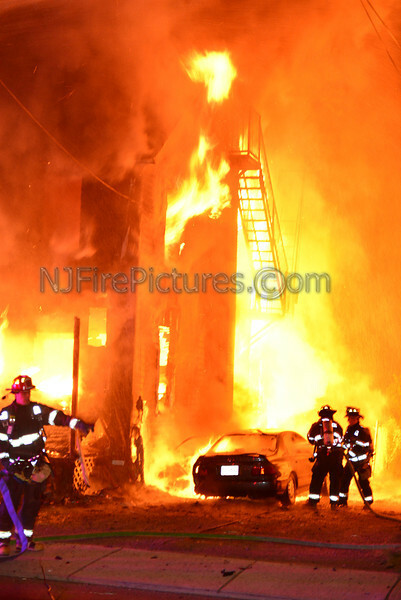 Upon arrival the found heavy fire showing from a large 2.5 story wood frame apartment building. Mutual aid was called immediately from Mine Hill, Dover, and Picatinny Arsenal Fire Departments. Multiple Master Streams, two deck guns and one ladder pipe battled the fire for an hour before bringing it under control. The exposure buildings suffered heat damage. The occupants escaped the building when they awoke to the fire alarm sounding and smoke in the building. St. Clares Hopsital EMS and Mine Hill EMS were on scene however no injuries were reported. The occupants were evaulated by EMS. The cause of the fire is under investigation.